I camp many places that don’t have electricity. I usually charge my phone, watch, and iPad through my tow vehicle. The last time I camped I drained my car battery. In search of another solution, Rachel at harps recommended using a marine charger on my battery box. This is what I did. My bathroom light was falling down. It also was a little worse for wear. I tried to clean it up while I rewired it. It was looking pretty good, but the lens was cracked. In the middle of the process, I was wondering if I could get a new one. I only install like items when I take a part out of the trailer to maintain the original look. The light is no longer made, but when I went on eBay, there was one for sale from New Old Stock – NOS. This a a new part from an old stock of parts that aren’t made anymore. People always ask how I keep the trailer shiny – you have to shine it! My first camp out is in three weeks, so it was time to pull down the trailer and do the preseason shine. I use Metal Gloss polish with my Cyclo polisher. I saw it at a car show and it works well. You can also use Nuvite S.
So I like hooks. Recently, Vintage Trailer Supply started making THE hook – the Byam Hook. Wally Byam, founder of Airstream, had these hooks all over his trailer during his famous caravans. Of course I removed my old hooks and installed these! My license plate holder was rusting from the inside. 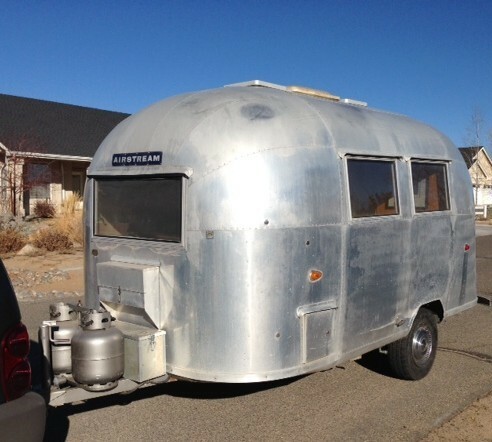 I bought a new one from Vintage Trailer Supply that is correct for the year. I installed it and there you go! When I installed the license plate holder, it had a hole left over from the old unit. I used an olympic rivet that leaves a tongue. You cut the tongue off with wire cutters. and … find off the top fo the rivet. This rivet doesn’t have the hole in the middle, so no water can get through it!